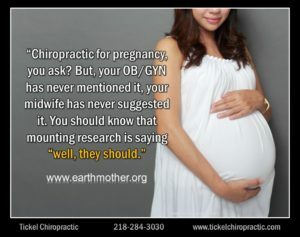 Chiropractic if you are pregnant?? ABSOLUTELY!! Keeping your spine free from vertebral subluxation complex is one of the best things you can do if you are pregnant. If there’s one group of people who need chiropractic spinal checkups more than any other, it’s pregnant women. Pregnant women need their bodies to be as healthy and as strong as possible in order to handle the rigors of pregnancy and childbirth. Chiropractic care will help ensure that the reproductive and other systems so essential for a healthy pregnancy receive a nerve supply from the spinal column without interference. The slightest interference to the nerve supply could adversely affect the mother and developing fetus. Pregnant women have many concerns: staying pregnant, carrying the baby to full-term, morning sickness, the normal development of the baby, backaches, leg pain, not to mention a safe labor. Q:Is Chiropractic safe in pregnancy? A: Very safe and very sensible for both mother and baby. Q: How late in pregnancy is it possible to get an adjustment? A: Patients have received adjustments even during labor. Q: Can spinal care help with postpartum depression? A: Chiropractic’s beneficial effects on emotional stress and personality have been noted and documented. Q: Can my baby receive chiropractic care? A: Infants a few hours old have been given spinal checkups and adjustments (if needed). For all your chiropractic needs, call our office for an appointment.